Islam places creativity and art at the centre of human existence. Everything humans produce has an aesthetic quality, even the way we drive or speak. Art is the ability to generate beauty and we can all be artists in whatever we do, by doing it beautifully. This is ihsan. For example, our relationships need the quality of ihsan. Sound relationships are creative, and are based on the recognition of others’ souls. Human beings are the summit of creation, not to exploit others but to help the rest of creation to flourish. The Muslim as khalifa is a gardener, an artist, a carer of ophans. If we behave in these beautiful ways we will naturally embue our surroundings with beauty, just as the “classical mosques were built in the form of peoples’ souls” (1) as natural expressions of beauty rather than deliberate artistic creations. Human beings have a special ability to distill and recycle beauty, meaning that we take the beauty of the natural world in through our senses, receive inspiration from the spirit (ruh), and then +add+ to the beauty of the natural world through our artistic creations. This cycle of creativity is the true source of sustainability. Al-Ghazali said that “True art is in hearth and earth” (1). Abdal Hakim Murad (AHM) comments that ‘earth’ represents the natural realm and ‘hearth’ represents the human realm. 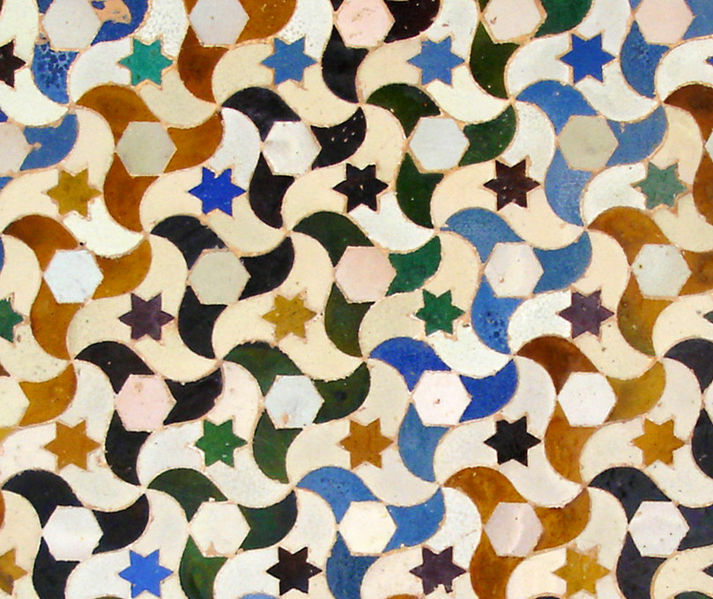 The natural world, particularly its mineral and vegetal forms, provides inspiration for Muslim art. The human form is not a basis for Muslim art and AHM criticises Michelangelo as a “pagan restoration” – not monotheistic. AHM said there is something ‘theophanic’ about the human face which naturally draws our attention and changes the nature of a space, therefore human images are not suitable in a place of worship. However, even with regard to the mineral and vegetal, Muslims go beyond the outward forms and observe the underlying archetypes. In mosques we rarely see actual pictures of flowers or trees, but instead we see patterns of sacred geometry which abstract the underlying archetypes from the natural world and create serenity in our hearts. Posted on August 17, 2012, in Islam, Religion, Spirituality, Sufism and tagged Abdal Hakim Murad, Al-Ghazali, art, creativity, ihsan, Islam, mosque, Ruh, sustainability. Bookmark the permalink. 1 Comment.